USA Fit Tampa Bay's 48 Hour Discount Bonanza Starts Midnight Tonight! Hurry! Discount code good for only 48 hours! Season Kick Off August 29th! Not a runner, but you want to be? Have a race on your schedule? Is this the year you check the Fort Lauderdale, Clearwater, or Disney Marathon or Half Marathon off your to do list? Whether your goal is to cross the finish line or you desire to qualify for Boston, we have a group for you! Green group runners with an established base can check out the details under the registration link for our new Team Fit program. Are you a fitness walker? Not ready to run yet? Bad knees, bad joints, simply no desire to run unless chased? We have a walking group that will blow you away. This group trains with us up to the half marathon distance - from 1 mile the first week to 13.1 miles 25 weeks later! The members of our walking group are fabulous, fun and focused. USA Fit Tampa Bay is a Half and Full Marathon training program that can provide you the training and the motivation required to succeed. With the resources of a National organization, our local club offers a proven training schedule of approximately 25 weeks. This dynamic program has been developed over the past 26 years and has helped thousands of runners change their lives. We provide a weekly schedule with opportunities for group runs Saturday mornings. These group meetings are great for lots of reasons. First, theyâ€™re a good chance to share the challenges and joys of training with others who are going through the same thing. Second, the weekly group meetings are important because members receive educational seminars on running-specific topics that round out their training with essential practical and strategic information. We bring together our members in a positive environment with other like-minded athletes, give them a carefully refined training structure to guide them, coach them skillfully, and watch the achievement happen. Participants show up each week to run or walk, to support each other in a common goal, and to hold each other accountable. In these ways, USA FIT is more than a training schedule; itâ€™s a way of life that helps members thrive both on and off the track. Our emphasis is on safety and achievement, and we find that often, these meetings represent the beginning of many lifelong friendships. We hope youâ€™ll join us. Our program begins August 29th. Registration opens at midnight tonight. 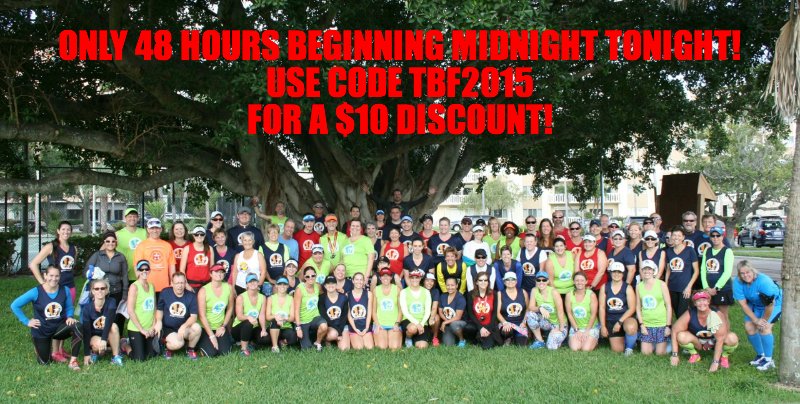 Remember to use the code TBF2015 within 48 hours to receive a $10 discount on sign up! Because no one likes to train alone! Training with USA FIT Tampa Bay provides a fun environment that sets you up to succeed at your running and walking goals. You'll get group workouts, weekly seminars and training schedules, a USA Fit Tampa Bay tech shirt, accountability, motivation and more. Sat., August 29th - Registration, seminar, and pace finder run/walk. Copyright Â© 2015 USA FIT Tampa Bay, All rights reserved.